We all know how popular is Apache from TVS Motor – Apache RTR 160 and Apache RTR 180. How about a 200cc version of TVS Apache? The motorcycle enthusiasts can now expect more powerful version of Apache as the company is all set to launch a higher capacity, 200cc version of this sports bike. TVS Apache 200 would be competing with bikes like KTM Duke / Duke RC 200 and Bajaj Pulsar RS 200 which are all quite popular in this segment. 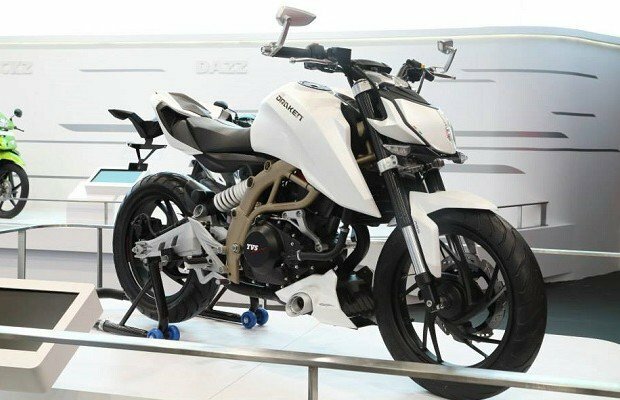 The design of all new TVS Apache 200cc is inspired from the Draken concept. The 200cc Apache is expected to be based on Apache’s existing “RTR” platform which hosts bikes like TVS Apache 160 and Apache 180. The all new TVS Apache 200 would be powered by 200cc, fuel-injection, one-cylinder, air cooled engine which is mated to a 6-speed gearbox. This new bike is built on the existing 180cc engine and would deliver more power of about 20bhp. The Apache 200 would sport new Michelin soft compound tyres that provides additional road grip. The 200cc TVS Apache would come with front and rear disc brakes with Combi braking system plus the anti-lock braking system (ABS). The launch of Apache 200 would happen in the month of November, during the festive season (Diwali).